1.0.1 What Is An Oscillating Mult-Tool? 1.1 Which Oscillating Multi-Function Tool is Best? 1.2 Cordless or Battery Powered? 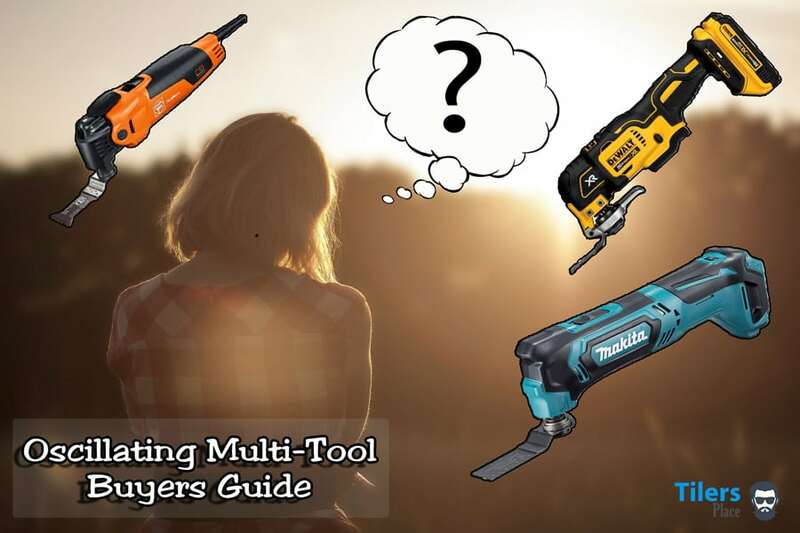 If you are looking to purchase a new multi-tool then read this Buying Guide for 2019 first! I will provide you with tips and things to look for and show some of the best oscillating multi-tools available. By the end of this Buyers Guide you will be ready to buy the best oscillating multi-tool for 2019 and have a wealth of knowledge under your belt. What Is An Oscillating Mult-Tool? Grab a swiss army knife, slap in a powerful 3 amp motor and crank it up to 11. That’s the oscillating multi-tool in essence. Okay, it’s not that exactly but it does feel that way when you got one of these in your hands. There’s virtually no limit to what you can do with these wonderful tools and it is no surprise they have become so popular this past decade. An oscillating tool is unlike any other tool out there as instead of cutting with standard 360-degree rotations it oscillates. Basically, the cutting head only moves forward and backwards a few degrees. Because those forwards/backwards movements happen 20,000 times per minute, some models can even go faster. When you couple these hyperspeed movements with a cutting blade, you get a tool that safely cuts through tough materials without any kick back and loss of control. This high amount of control makes the oscillating tool a great tool for power tool beginners as the risk of personal injury is virtually nil compared to traditional cutting tools like sabre and skil saws. They are also very easy to control and operate in cramped or awkward conditions, making them a common tool on building sites all over the world. Anyone from carpenters to plumbers, electricians, painters and plumbers find the versatility of an oscillating multifunctional-tool a must have in their tool chest. The versatility comes from the massive range of blades available for the user to attach to their multi-tool and there’s a blade for every occasion and material. Along with the option of blades, the user can opt to purchase a cordless oscillating tool or a corded one. Each tool comes with their individual pro’s and cons but the power and overall design remains the same. Think back to the last time you watched an infomercial, the one with the kitchen utensil that does it all. It’s always the same old gag, with the black and white footage of a kitchen counter full of appliances no one really needs but always has gathering dust in their cupboards. Then there’s the magical moment of clarity as our domestic damsel in distress gets the wonder product that does all their jobs and throws away the useless appliances. Take that ad and the magical do-it-all product, and instead move it to the home workshop and replace the product with an oscillator multi-tool. The cutting and sanding tool is the real world’s version of a do-it-all tool that actually does what it says. No hyping up the smallest details, no limited time offers and buy one get another free deal. This tool doesn’t need those gimmicks because it sells on its own merits. The manufacturers that make them know they have a great product and they don’t need infomercials to sell em. The only reason I compare an oscillator multi-tool to an infomercial product is that it can do the same job that a lot of other common tools do. – Removing old grout and caulk. – Sanding wood, paint, varnish. – Removing mortar from tiles. – Cutting holes in drywall. In my profession as a tiler, the multi-functioning tool is an invaluable piece of equipment in my kit. With just one tool I can cut holes for light and plumbing fixtures in drywall, I can cut seized toilet bowl screws or copper piping. Trim door casings to allow my tiles to fit underneath and scrape off old vinyl or residue on floors. The function I use it the most for is grout removal. As a grout removal tool, the multiple function tool is very hard to beat. It’s easy and safe to use, doesn’t throw up dust like a grinder would and it’s quick! There is a reason why I call it the best grout removal tool ever made and that still applies in the year 2019. I wrote a dedicated guide to remove grout with an grout removing multi-tool, you can check it out here if you are thinking of grout removing in your home. It is also great for grinding away old mortar from tiles when I am reusing them, as I can fit a diamond grinding blade to my multi-function tool and work away the material until my old tile is new again. This is just an example of what you can use your oscillating multi-tool for, take a moment and think what YOU could do with one. 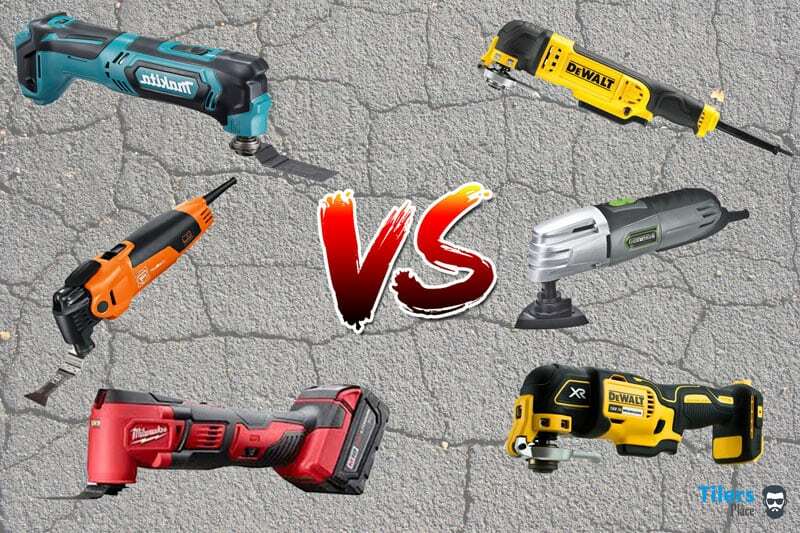 Which Oscillating Multi-Function Tool is Best? The versatility of the oscillating and cutting multi-tools never ends as they even come in both cordless and corded options to best suit the user’s requirements. With everything that exists on Planet Earth, there are pros and cons. After deciding on which brand of oscillating multiple function tool you want to buy, the next biggest factor for you will be to decide whether you want to go cordless or not. The bottom line is that a corded oscillating multi-tool will never run out of power, it will keep going till it overheats or your arm vibrates off your body. The never-ending power does come with the major facet that is the power-cable dragging behind you, whether you go. This add’s a health hazard to your worksite or home as it’s a trip hazard and also means it get’s in your way during work. You could also accidentally cut through it with the electric tool as well which could lead to further consequences, think about that. With the major factor out of the way, let’s break down the two power variants of the oscillating multifuncion tool and by the end, you will have a clear idea of which version is right for you. When deciding whether a corded multi-tool is right for you, the main thing to consider is how much use the power tool will get. Are you wanting to use the oscillating multi-tool every-day/a few times a week or will you only be using it for occasional jobs when the need arises? If you are a home handyman or a small scale house flipper, I would recommend purchasing a corded oscillating multi-tool. If you work from the comfort of your own workshop, like a cabinet or furniture maker, then a corded variant will also work best for you as your power requirements are always there. The power tool will always be available with a quick extension cord and you will not have to worry about having a battery fully charged on the day. So if a sudden job pops up and you need to sand a window frame or remove some grout, the corded oscillating multi-tool will be ready to rip when the need arises. Along with the electric multi-tool always being ready for action without prior preparation; corded varients of this power tool also benefit from greater power. Since they run on 110 volts (or 240 volts in other countries), their motors are much larger and offer higher amp ratings. These provide the tool with more torque and in certain brands, a higher max oscillation speed in comparison to their cordless brethren. Working on sites without power? Choose a cordless multi-tool to ensure you can get the job done! A common example of this would be the two DeWalt multifunction-tools. The share many of the same features (quick blade attachments, variable speed trigger and locking button) and functionality but their motors differ. The corded DWE315 has a motor capable of 22,000 oscillations per minute (OPM) while it’s cordless brother; the DCS355 that runs on batteries, only manages 20,000 OPM. While the difference might not be even noticed by most, I feel it’s a factor that needs to be pointed out as we are comparing the two variants. You will notice the design of the two multifunction devices is similar but their power supplies force for certain design cues that are universal across all brands of multi-tools. The corded varients are always longer to accommodate a large motor and this will affect their portability and use in tighter spaces. One will find working a corded multi-tool in awkward spots like linen closets or under sinks to be more difficult than if they had chosen a cordless oscillating multi tool. While the length may seem like a detractor, there are elements that make it easier to use because of the extra bulk. For one, you have more surface area to place another hand on the machine and use it with more precision. When I am removing grout, for example, I like to use both hands to ensure I have a firm grip on the power tool and avoid scoring across the tiles surface. The longer design also promotes a better weight balance on the tool, it is not bottom heavy like a cordless oscillating tool would be, especially with a large AH battery pack attached. The last thing I need to mention on the matter of corded oscillating tools is, due to their engine design they still require carbon brushes to operate. These carbon brushes are a part that requires replacing with time and use of the tool, it’s a factor you need to consider. This requires you to purchase a new set of carbon brushes, taking apart the tool and replacing the worn out brushes. A power tool shop should be able to do this service for you but if you are looking at a corded oscillating tool, I suggest you research the model you are interested in to see if they run on brushes. If they do, keep it in the back of your mind that one day (in a year or two) you will need to replace them. • Portability – You will be running a power cord behind you where ever you go and tight spaces are more difficult to work in. • Electricity – Sites will no power or limited power sockets will become an issue. • Carbon Brushes – Most corded oscillating tools require carbon brushes and may need replacing down the line. 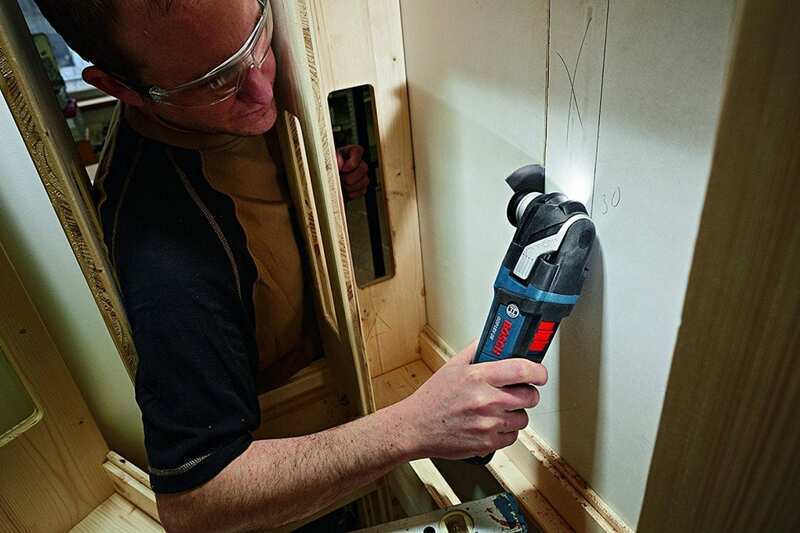 An immediate deciding factor in buying a cordless oscillating multiple function tool is whether you already own batteries from the major power tool manufacturers. Most of the time, a bare-tool (just the tool without the battery) can be purchased for much less than the combo kit and since you already own a battery (or 3) that you use in your other power-tools, you can pick up a cordless oscillating multi-tool for a bargain. If you are in this situation, picking up a cordless oscillating multi-tool should be a no-brainer and the decision is made for you. If you are on a budget you can just buy the bare tool and be ready to rock (after you buy some multi-tool blades for it) but if you are willing to spend a few bucks more, you can get great combo sets for a real steal. Since you are used to cordless tools, you’ll be in the habit of always charging your batteries and will always have a fresh one ready to slap into whichever tool you need it for. Let’s take a look at the tool in general. The main benefit from a cordless oscillating multi-tool is obviously the portability. You can climb a ladder and use it without dragging a power cord up with you, can climb into a tight space or under a house or kitchen sink and cut, sand or scrape to your heart’s content. There will be no cable to drag around and the more compact design of the cordless multi-tool will make the job a whole lot easier in those tighter spaces. I love my DeWalt DCS355 and it’s portability, especially when removing grout in showers. I can zip all the grout out in the tight space and angle it whichever way I need to get that stubborn grout out of the tiles. The reduced power and speed of the cordless system has never been a major factor for me, I only feel the difference if I use a corded oscillating multi-tool directly after using the cordless one. For day to day usage, a cordless oscillating multi-tool has more than enough power and grunt to take on whatever you throw at it. This is especially true if you own one of the professional power tool brands like DeWalt, Milwaukee, Fein and Bosch to name a few. They produce the best lithium-Ion batteries that last, with quick recharge times and long-running time to back up their massive performance. If you do not own any cordless power tools from these bigger names but are wanting to buy a battery powered multi-tool, I would strongly advise you to go with them before buying a dirt cheap cordless tool. I have seen some cordless multi-tools sell for as little as 15 dollars and trust me friend, that’s money better spent on some flowers for the lady or a lunch out. You will get what you pay for and chances are that tool will crap out before you even finish the job. There is a strong reason why they are so cheap and it all directly affects performance. A cordless tool for 15 or even 30 dollars will not have the quality materials needed to put in the hard work like the professional brand tools nor will the battery be worth your time. Expect a charging time of half a day or more and a running time of 10-15 minutes, depending on the load the tool is under. Don’t expect the build quality to survive a drop impact or any common abuse a proper multi-tool could brush-off either. If you are an amateur user and won’t be needing one much, just buy a cheaper brand corded oscillating multi-tool. It’ll save you a lot of time and hassle. What we can conclude from all this is that the cordless oscillating multi-cutter is the superior option, especially if you already own a cordless system. With the benefit of interchangeable batteries and the ability to take your tool anywhere you do, it’s the flexibility that really seals the deal with this power-tools. Nowadays, Lithium-Ion battery technology has gotten so good that having a battery powered tool does not come with a large handicap of running time and power. If you got the budget and the need, I seriously recommend you buy a cordless multi-tool, it’ll be worth every penny. Congrats, you have just learned a great deal about the best multi-functional tools but are you ready to apply that information to choose which one to buy? Fortunately, I have done the hard yards for you and found a oscillating multi tool that really stand out amongst the rest. I spent most of my weekend looking through and researching all the oscillating tools available on Amazon and local Home Depot stores and managed to get some hands-on experience with brands I have never played with before. Listed below are the best multi-tools in my opinion as a seasoned and experienced user of power-tools and obsessive researcher of anything that interests me. 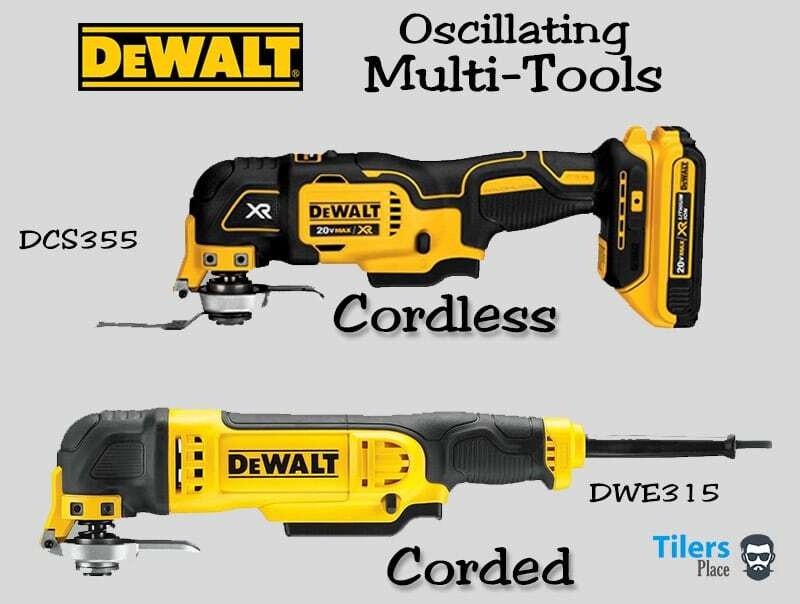 For regular readers of Tilers Place, the inclusion of the DeWalt DCS355 oscillating multi-tool as one of the best multi-function tools comes as no surprise. What can I say, I own one of these bad boys and I love It! I didn’t call it the best removing grout tool for nothing in my previous grout removal posts either. Here’s a quick review of the DeWalt DCS355 oscillating multi functional tool. The DeWalt DCS355 offers a great combination of modern features like quick blade release, LED light for illuminating the work area and a brushless motor. Add the compatibility of DeWalt’s amazing 20-volt batteries and an affordable price-tag and your onto a winner. DeWalt really knocked it out of the ballpark when they designed the DCS355 and it’s wide popularity and glowing reviews from professionals and handymen alike confirm this. Amazon itself has over 600 positive reviews about the DeWalt DCS355 itself with a general score of 4.7 out of 5 stars. Remember that Amazon isn’t the only website selling these multi-tools and after doing some research, I found over two thousand positive reviews about the DeWalt DCS355. If you were willing to look around, I’m sure that number could be increased 10-fold. So if you don’t believe me, you can go and read reviews from 20,000 folks just like you, that love their DeWalt multi-tool. One feature that set’s the DeWalt DCS355 apart from all the other oscillating tools on the market is the variable speed dual grip trigger. This offers a premium level of speed control that is literally at your fingertips. 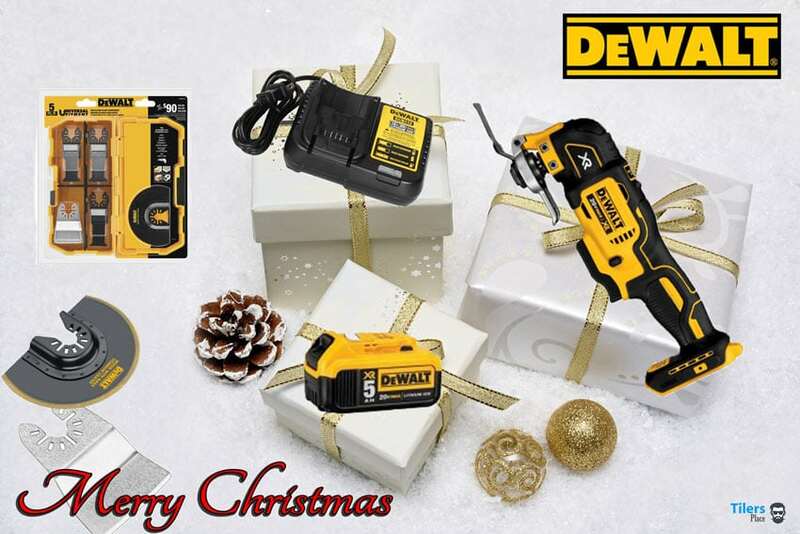 DeWalt also understands that you will be using their multi-tool in all sorts of positions and configurations and have adjusted the trigger to suit. You can hold the traditional shorter part of the trigger with a single finger if you are looking for fine speed control. This is ideal for delicate cutting operations or sanding details. Alternatively, you can use the longer section with multiple fingers for long and intensive work. There is also a handy hold button located near the trigger that will lock the trigger in place and allow you to work without holding it. I prefer this variable speed trigger over the traditional rotary speed dial found on all over multi-tools because it allows me to make speed adjustments on the fly. I do not need to stop work to set a faster or slower speed to suit the task. With a squeeze I can dial in the speed I need to get to work. Also, this trigger avoids a common problem that occurs with rotary speed dials over time. I have found that the strong vibrations that the multi-tool creates can inadvertently cause the rotary dial to turn by itself, this is especially the case when your tool starts getting older. The rotary dial gets looser and looser in its casing and the vibrations will cause it to either turn down or up while you’re using it. My old Bosch multi-tool is incapable of staying on its top setting now. Every time I set it to 6 (top speed), it will vibrate its way down to 3 or 4 in moments. This forces me to hold the rotary dial with one hand and work with the other, this is a problem for many obvious reasons. Now, thanks to the variable speed trigger introduced by DeWalt, I no longer have this problem. • Powerful LED Light to illuminate the work area. • Universal adapter for use with most oscillating multi-tool accessories and blades. Thinking of buying the DeWalt DCS355 but wanting more bang for your buck? I found the best combo kits and accessories that take your hard earned money further and give you the best oscillating tool kit fit for a king. This bundle is highly recommended for those who already own DeWalt tools and are wanting to add the multi-tool to their arsenal. You get the bare DCS355B tool along with two wood cutting blades and two 5.0AH XR 20 Volt Batteries. This is a great deal as the kit costs less than if you purchased everything separately. 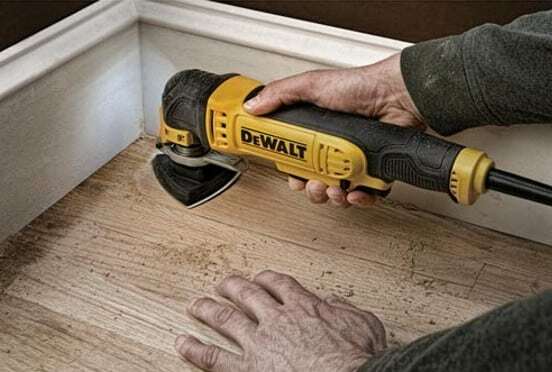 The best part is you can use the new batteries in all your other DeWalt cordless tools! Quick Tip – Charger is not included! Click Here To Buy Your Twin Battery Combo Kit. This bad boy makes you feel like a little kid at Christmas time, with some many goodies to play with and enjoy. It provides you with everything you need to get going on any project you may require and so much more! It’s the best kit to buy if your just starting your power tool collection or want the best multi-tool kit available. Satisfaction of knowing you have the best kit available! Click Here To Buy Your DeWalt DCS355D1 Kit. PreviousThe Multi-Tool Is The Best Grout Removal Tool – Here’s Why!